The Baragatan Festival is a month-long event that celebrates Palawan’s rich culture and interesting traditions. From the local term bagat, which means “to converge,” the Baragatan Festival is a meeting of various cultural groups from around the province, showcasing their unique characteristics, eventful histories, and popular products. The festival begins with a colourful float parade with floats created by various municipalities and organisations around the province, representing local artistry, customs and handicrafts. It culminates with an enthralling street dancing competition in the grounds of the provincial Capitol building in Puerto Princesa. 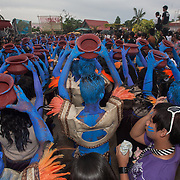 Each dance troupe from all regions of the province prepare themselves with body paint and colourful, flamboyant costumes, and create a performance that is a creative description of their cultural and geographical identity through dance and music. And as always with festivals in Palawan, the final icing on the cake is a beauty pageant to remind everyone that the people are just as beautiful as the province is. Palawan is home to several indigenous groups, namely Batak in the northeast, Tagbanwa in the central and northern parts, and Pala’wan in the south, both in the mountainous interior and the lowlands. The Batak are a shy peaceful mountain people living close to nature with traditional belief in spirits of nature. They live as hunter-gatherers collecting honey, resin and rattan from the forest, which they can sell to lowland traders for cash or exchange for useful items, and hunting for bearded pigs. During the past three decades they have been severely impacted by the influx of settlers and logging operations, such that their numbers have diminished to about 300, and undernourishment has made them more vulnerable to disease. 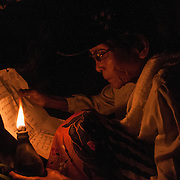 The Bataks are now considered as one of the vanishing cultural minorities in the Philippines. The Tagbanwa are one of the oldest ethnic groups in the Philippines. 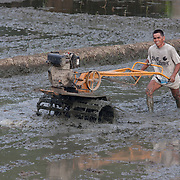 They practice shifting cultivation of upland rice. Rice is considered a divine gift and is fermented to make rice wine, which they use in Pagdiwata, or rice wine ritual. 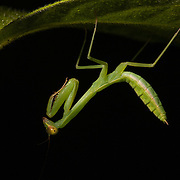 They believe in several deities found in the natural world and maintain a strong connection with the spirit world in their rituals. They are excellent in basketry and woodcarving, and famous for beautifully crafted body accessories such as combs, bracelets, necklaces and anklets. The current population is estimated at over 10,000. The Pala’wan or Palawano tribe in the south closely resemble the Tagbanwa, and probably share the same origins. Most of them are now settled in the highlands of Palawan and practice subsistence farming, hunt wild animals with poisoned spears and catch fish using a root sap in shallow streams and rivers. They practice a religion, which is a mix of traditional animism, with elements of Hinduism and Islam. Their traditional land is currently under severe threat from nickel mining in the south, and they are working with anti-mining activists and environmental groups to oppose this. 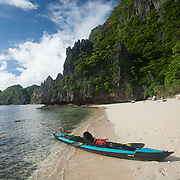 When I first went to Palawan in 2009, my first objective was to kayak around the Bacuit Archipelago in the north-west, one of Palawan’s greatest natural treasures, where there is a group of spectacular limestone karst pinnacles jutting out of the sea, similar to Halong Bay in Vietnam and the Phi Phi area of southern Thailand. The small coastal town of El Nido is the gateway to the spectacular vista of karst towers dotted around the bay. I set up my camp on Matinloc Island on the outside of the bay, from where I could make day trips to the other islands and find the best places for snorkelling. My biggest logistical problem was taking enough fresh water because there is no standing water on the limestone islands, so I was compelled to make weekly shuttle run back to El Nido to collect water and fresh food. It was on the verge of the rainy season and on several occasions I experienced sudden squalls when the tranquil conditions rapidly changed and I was being pounded by icy cold water on a very choppy sea. Instead of entering the sea to cool off during the hot sunny days I found myself immersing myself just to stay warm. On my first night camping out on the way to Matinloc Island I made the mistake of pitching my tent under a tree that I later discovered was full of caterpillars. They rained down on my tent and proceeded to spin their cocoons under the flysheet, and prior to that they nibbled holes in the mosquito netting! 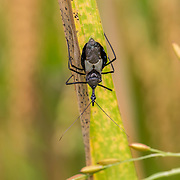 With virtually no standing water on the islands I was very surprised to discover that there was no shortage of mosquitoes. In fact they were so bad that I devised a new strategy for “culling” them. I waited until there were enough buzzing around me before running into the sea and immersing myself up to my neck. The bloodthirsty mosquitoes followed me and then I proceeded to clap around my head and eliminate them. After doing that a few times I managed to reduce them to manageable levels. It would have been an entertaining spectacle for a passer by. 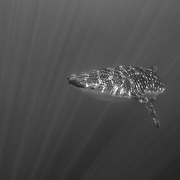 Migration has played a big role in the development of Palawan. Before 1900, people from Cuyo and other islands migrated to Palawan. It started as a seasonal farming activity, but as opportunities in Cuyo became scarcer, families moved to Palawan permanently. 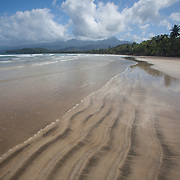 After the Second World War, migrants streamed into Palawan from other regions of the country looking for agricultural land and the opportunities offered by Palawan’s natural resources. A settlement area in south-central Palawan covering 24,000 ha was established in 1950 to accommodate settlers from Central Luzon. Migrants were then pushed further up the mountains by successive waves of migrants, which also caused further displacement of the indigenous tribes. Migration has severely impacted native cultural traditions and the environment. People also came with the logging and mining companies in the 1960s and 1970s, and more recently with the tourism industry. Migration has accounted for about half of the population growth of Palawan. The population increased from 106,000 in 1948 to 320,000 in 1980; by 1995, it had reached 627,000. Over the years, various government regimes and private companies involved in mining, logging and tourism have made immigration significantly easier. Palawan now has the highest rate of immigration in the Philippines. It is engaged in mainstream development, and its natural resources are consequently being substantially reduced. The loss of its biodiversity in the forests, mangroves and coral reefs can be directly linked to the increase in population. As in past decades the larger proportion of migrants to Palawan have been farmers. The activities of these farmers and loggers are responsible for the conversion of Palawan’s one-time tropical forest landscape into an agricultural one. Unrestricted migration to Palawan can be viewed as an indication of the government’s inability or unwillingness to control population growth in other parts of the Philippines. The Philippines is a devoutly Roman Catholic country and this is most clearly evident during Holy Week over the Easter period from Palm Sunday to Easter Sunday. On Palm Sunday, worshippers carry palm fronds to church to be blessed by the priest. Many Filipinos take them home and place them on door lintels or windows, in the belief that the fronds can ward off evil spirits and avert lightning. On Good Friday there is a street procession in Puerto Princesa that re-enacts the way of the cross, with fanatical devotees engaged in self-flagellation and prostrating themselves at roadside alters on the way to the Immaculate Conception Cathedral. The smell of blood fills the air, and if I ever get too close to the devotees to photograph them, then I often have to wipe the blood from my lens. Catholic bishops have discouraged such acts of extreme penitence, especially the even more grisly act of crucifixion, which is still performed, often clandestinely, in some parts of the Philippines. In Puerto Princesa a crucifixion is re-enacted at Calgary Hill using a life-sized replica of Jesus Christ. 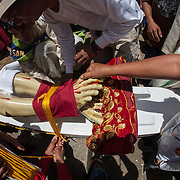 On the evening of Easter Sunday there is a candle-lit procession of hundreds of people, and vehicles carrying religious effigies, from the cathedral through the streets of Puerto Princesa. On returning to the cathedral worshippers gather at the entrance to light hundreds of candles. It is a beautiful, if not rather hot, spectacle to photograph, with scores of reverential faces illuminated by candlelight. The Puerto Princesa Subterranean River National Park, also called the Puerto Princesa Underground River, is a site of global significance. The park features spectacular limestone or karst scenery with a cave system extending for 24 km, and an 8.2 km long underground section of the Cabayugan River that flows directly to the sea. The lower 4 km is navigable by boat. The cave includes major formations of stalactites and stalagmites, and several large chambers, including the 360 meter long Italian’s Chamber, one of the largest in the world. The park contains mountain to sea ecosystems, with moist forests, which are among the most significant in Asia and noted for high levels of endemism, descending to mangroves, sea grass beds and coral reefs. It was established as a National Park in 1971 and a UNESCO World Heritage Site in 1999. The park has a range of forest formations representing eight of the thirteen forest types found in tropical Asia. 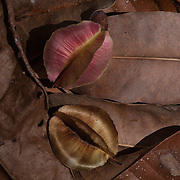 More than 800 plant species have been identified, including 295 trees dominated by dipterocarps. Of the 252 bird species found in Palawan, 165 species, including all of the endemic species, have been recorded in the park. 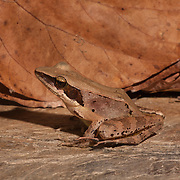 In addition there are 30 known mammal species, 19 reptiles, 8 of which are endemic, and 10 species of amphibians. Dugong and hawksbill turtles feed in the coastal areas of the park. 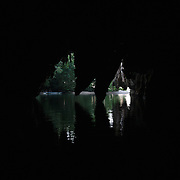 Inside the cave there are 9 species of bats and 2 species of swiftlets. One of my most memorable wildlife experiences in Palawan was being able to paddle my kayak up the river after normal opening hours, when the two “shifts” were passing each other. Just as the swiftlets were returning to roost in the cave after foraging outside in the day, the bats were heading out for the night. The coastline of the park with the surrounding forested mountains, and the setting of the entrance to the underground river near the beach, is unquestionably one of the most beautiful locations that I have ever been to anywhere in the world. 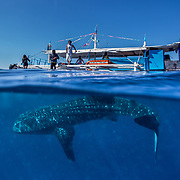 Dolphin and whale watching has become one of the most popular tourist attraction in Puerto Princesa, in addition to swimming with whale sharks. They can usually be found a short distance from the city, especially the most common, resident and highly entertaining spinner dolphins, or as they are called locally – lumba-lumba, that are always prepared to approach the dolphin watching boats to thrill the excited passengers. 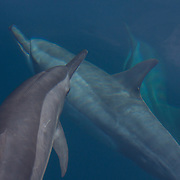 Other species of dolphins and whales that can be seen are bottlenose dolphins (Tursiops truncatus), pantropical spotted dolphins (Stenella attenuata), Risso’s dolphins (Grampus griseus), Fraser’s dolphins (Lagenodelphis hosei), short-finned pilot whales (Globicephala macrorhynchus) and Bryde’s whales (Balaenoptera brydei). Malampaya Sound at the northwest of Palawan is another good area where dolphins can be seen, especially bottle-nosed dolphins and Risso’s dolphins, and rare Irrawady dolphins (Orcaella brevirostris) in the inner sound. Another population of Irrawady dolphins, or as they are called locally – lampasut, has been recently discovered off Quezon on the west coast. 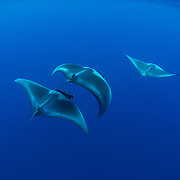 At least 20 individuals were sighted at one time, which is a relatively large pod for this rare species, where groups of fewer than six individuals are most common. The Irrawady dolphin is listed by the IUCN as critically endangered. Local fishermen around Puerto Princesa are very much involved with protecting the dolphins and promoting dolphin watching as volunteer wardens and spotters, and collecting any potentially harmful garbage from the areas frequented by dolphins. I decided to go to the island province of Palawan in the Philippines for a kayaking trip in 2009 after reading that Jacque Cousteau described it as the most beautiful place that he had ever dived in. The island province is one of the most biodiverse regions in the Philippines, and still retains half of its primary forests, particularly along its central spine of mountain ranges, and was recently identified in a study published in “Science” magazine as the world’s fourth most irreplaceable area for unique and threatened wildlife. 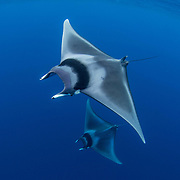 49 of the animal and 56 of the plant species found there are listed as globally threatened with extinction by the IUCN. 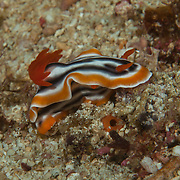 Much of its unique flora and fauna has a greater affinity with the islands to the west, especially Borneo, than the rest of the Philippines. 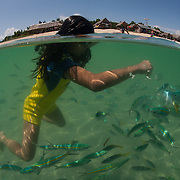 In an effort to preserve its unique biodiversity UNESCO declared the whole province a Man and Biosphere Reserve in 1990, and included two World Heritage Sites: The Tubbataha Reef Marine Park and the Puerto Princesa Subterranean River National Park. The declaration was also enacted to protect its three indigenous communities and their tribal lands: Batak in the central and northern parts, Tagbanua in the central, northern and southern part and Pala’wan in the south. Although Palawan still has a relatively low population density, large areas have been degraded and are under threat, particularly from mining in the south. In spite of previous conservation efforts, the Provincial Government of Palawan is currently favouring the intensification of mineral exploitation. In 2010 I became involved with producing a book of photos of the provincial capital, Puerto Princesa, and was working on the project with the well known environmental campaigner and radio journalist, Gerry Ortega. Shortly after leaving his radio station in Jan 2011 he was gunned down. It is widely believed that he was murdered because he had publically and repeatedly spoken out against the government’s mining plans.